This entry was posted on October 17, 2012 by Paul. 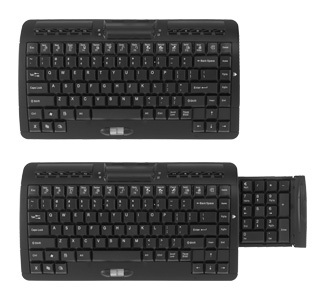 Here is the ideal solution for computer users who want the ergonomic benefits of a compact keyboard while still having ready access to a number pad. Posturite’s mini-arch keyboard has an integral, fully-functioning number pad that slides out sideways when required, but otherwise stays neatly tucked away. This avoids the need to buy a separate number pad as with most other compact keyboards. An extensive range of function keys, along with quick push paddle keys, makes Posturite’s mini-arch an exceptional all-round compact keyboard for the office or multimedia environments where space is at a premium. Because of its size, it is easy to carry around for use with laptops, and it also frees up space on the desk so that users can avoid unnatural mouse arm angles. Used in conjunction with Posturite’s unique Penguin ambidextrous vertical mouse, the number slide keyboard is the perfect ergonomic solution for anyone who spends a lot of their day at a computer.